Anyone who has watch ed my youtube channel knows how much I LOVE to work with my ancestors, so naturally I was very excited when I came across Weaving Memory. There are certain aspects that do not resonate for me with this book just because they are more cultural (the author is of Cuban decent). There is nothing wrong with this but since I wasn’t of the same cultural background, it didn’t really call to me on that aspect. I will be taking the aspects that she has pointed out within her cultural background and use it as a springboard to figure out more of what my cultural background is and how to use it in my personal workings. So it gave me a lot to think about in my own practice. Honestly the cultural aspect is really probably the only problem that I had with the entire book. She has had several others write in about their own separate practices with their ancestors and included them throughout the book. I can’t praise this book enough as a way to start working with your ancestors. I hope she will make another book going into more depth into honoring and working with ancestors in the future, as I would love to learn more. 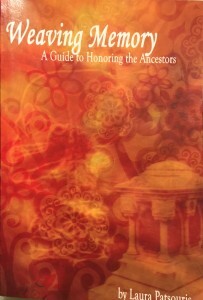 If you are just starting to work with your ancestors you can find this on Amazon and I highly recommend it.